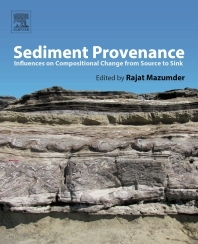 Sediment Provenance: Influences on Compositional Change from Source to Sink provides a thorough and inclusive overview that features data-based case studies on a broad range of dynamic aspects in sedimentary rock structure and deposition. Provenance data plays a critical role in a number of aspects of sedimentary rocks, including the assessment of palaeogeographic reconstructions, the constraints of lateral displacements in orogens, the characterization of crust which is no longer exposed, the mapping of depositional systems, sub-surface correlation, and in predicting reservoir quality. The provenance of fine-grained sediments—on a global scale—has been used to monitor crustal evolution, and sediment transport is paramount in considering restoration techniques for both watershed and river restoration. Transport is responsible for erosion, bank undercutting, sandbar formation, aggradation, gullying, and plugging, as well as bed form migration and generation of primary sedimentary structures. Additionally, the quest for reservoir quality in contemporary hydrocarbon exploration and extraction necessitates a deliberate focus on diagenesis. This book addresses all of these challenges and arms geoscientists with an all-in-one reference to sedimentary rocks, from source to deposition. 11. Why did Sporadic Glaciations Occur? Dr. Rajat Mazumder received his M.Sc in Applied Geology in 1991 from the University of Allahabad, (India) and his Ph.D from Jadavpur University (India) in 2002. He was a Post-doctoral Fellow of the Japan Society for the Promotion of Science (JSPS) at Yokohama National University (2002-2004), Alexander Von Humboldt Foundation (2005-2006) at Munich University, Germany, and was a recipient of JSPS short-term invitation fellowship for experienced researchers in 2008. Dr. Mazumder taught Sedimentary Petrology, Mineralogy and Precambrian Stratigraphy at Asutosh College (University of Calcutta, 1999-2002), Indian Institute of Technology Roorkee (2006), and was an Associate Professor of Geology at the Indian Statistical Institute (2006-2013). He was a Research Fellow at the University of New South Wales Australia (2012-2014). Currently, Dr. Mazumder is an Associate Professor at Curtin University Sarawak, Malaysia and teaches Basin Analysis and Petroleum Systems, Tectonics and Dynamic Earth and Metamorphic Petrology. Dr. Mazumder was one of the global co-leaders of UNESCO-IGCP 509 research project (2005-2009) on the Paleoproterozoic Supercontinent and global evolution. He is an advisory editor of the Journal of the Geological Society of London and an Associate Editor of Marine and Petroleum Geology. His research is mostly focused on the earth’s surface processes during its early history. The coverage of the subject was more comprehensive than I expected and despite numerous authors the topics were consistent and complementary. Most were logically structured and supported by recent references. It was an excellent coverage for a person entering this field or needing to refresh their knowledge. The supporting diagrams and photos were generally clear and useful.